As sport surfacing specialists we build many different facilities throughout the UK and we recently carried out a polymeric MUGA court installation project in Cheshire. The process involved renovating an existing run down tennis court and transforming it into a top quality all purpose sports facility. This sort of work is completed by our team on a regular basis so please feel free to get in touch with us if you’d like more information. Fill in the enquiry box on this page to let us know what you need and we’ll respond with some helpful advice. For this particular project, the existing surface was a worn out tennis court which had become contaminated by moss and algae and was no longer suitable for use. We began the polymeric sports court installation by excavating this area to remove the damaged court and prepare the ground for the new surfacing to be installed. The next stage of the groundworks was to install a dynamic stone sub base which gave the foundations a completely even surface. We used specialised porous stones which are strong and stable but also allow water to drain through so the facility can be used in all weather conditions and will not become flooded. 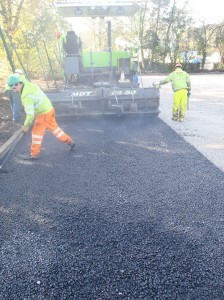 Once these angular stones were installed and compacted, we then put down a layer of macadam which creates a flat and smooth base for the EPDM rubber surfacing to be installed onto. After the macadam base layer had been put down, we then installed the polymeric rubber surfacing and smoothed it out before leaving it to cure. This type of rubber is commonly used for multi use sports courts because it’s extremely hard wearing and versatile. The EPDM rubber surfacing can be used for sports like netball and basketball as well as tennis and football so it’s ideal for schools and sports clubs. 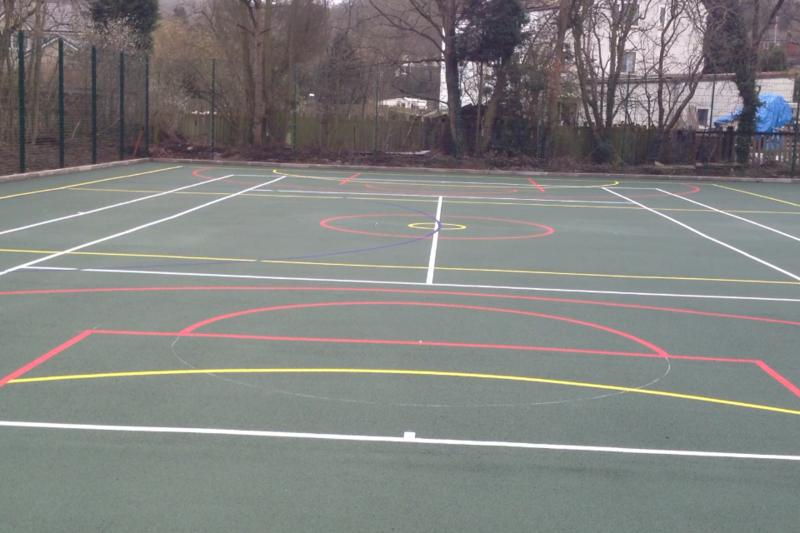 Once the polymeric surfacing had cured, we then applied a polyurethane anti slip paint coating in green to give the court the right playing qualities for a range of activities. 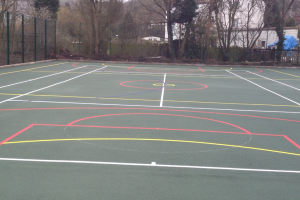 Multi use line markings were also applied in non slip paint in contrasting colours so that the court can be used for a variety of different activities. The final part of the EPDM surface construction was the addition of specialist twin bar sports fencing. This is a durable and strong fencing specification which can withstand heavy use with a lot of different sports and keeps the facility safe and secure at all times. When the multi use games area construction process was complete, the finished product was a massive improvement on the existing run down tennis court surface which was there before. The new facility can be used in all weather conditions for a range of different sports and activities and will be kept secure by the specialist fencing system. An appropriate MUGA cleaning and maintenance scheme will help to keep the MUGA surfacing in top condition and ensure that it is safe for use for a long time. If you’re thinking about having a polymeric MUGA sport court installation carried out at your school, college, club or private sports facility please get in touch with us. You can visit our website at https://www.sportsandsafetysurfaces.co.uk/ to find out more about our products, or alternatively you can fill in our contact form with your details and we’ll offer you a price for the works based on the project specification and site location. We have carried out many similar construction jobs throughout the UK and we will gladly help you to design the perfect sports facility which meets all of your requirements and stays within your budget. Please share this post if you thought it was interesting, and don’t forget to leave us a comment below if you have any questions about this polymeric MUGA court installation.